« A new look for 96th St.
How about taxing people upstate and increase the thruway tolls. We fund their perfectly smooth roads with our tax dollars while we have potholes AND their moronic assemblymen/senators actively work against legislation thats good for the city often *cough* CONGESTION PRICING *cough*. Its time they payed for us. Ben, seems to me that the choice presented between tolls and cuts in service was a strategic mistake. People don’t believe service will be cut until its actually cut. Had the MTA introduced the concept of zone pricing on buses and subways as an alternative to tolls it would be clear which was the lesser of two evils for Bronx, Queens and Brooklyn legislators. There are several problems with zone pricing. The deficit is an acute problem that requires an immediate solution. The MTA does not have the technology to implement zone ricing, and the stations aren’t configured for it. That takes zone pricing out of the equation. Fare hikes and service cuts are the only levers that can make an immediate impact. Beyond that, zone pricing basically means “making the outer boroughs pay more,” which would never fly in the legislature, especially given the huge technology investment required to implement it. If you think it’s hard to get bridge tolls approved, that’s child play compared to zone pricing. Actually we had zone pricing of sorts before 1994 and the “two-fare” zones ended. That period coincided with the Pataki administration borrowing for virtually all of the MTA needs. Now the opposition to bridge tolls comes almost exclusively from those former two-fare zones. 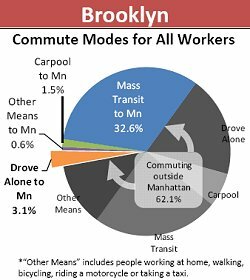 Even though those areas of the “outer-boroughs” have the most heavily subsidized service, lowest capacity utilization and most transit problematic land use they continue to gripe that they are “under-served” by the MTA. The political representatives pay back the rest of the system by refusing to support the MTA budget by any means other than borrowing. The MTA could do worse than reverting to the two-fare zone system. What was this two-fare zone? I’m not quite sure what you mean by that. New York City’s never had any sort of zone pricing for subway fares. Ben, this was before Metrocards allowed a free transfer from bus to subway and vice versa. The two-fare zones were places like Northeast Queens where you had to pay both a subway and a bus fare to get to Manhattan. Oh. Duh. Yeah. I remember those days. It never occurred to me to think of that as a two-fare zone, but that was the case even in Manhattan, say, going crosstown. I am guessing that this is why we have not so far gotten the new schedule out for next pick. They are still trying to figure out what will be cut and what will be saved. My question is since it will take at least a year to get these toll booths up, the signs and traffic flow figured out, when exactly is transit going to get this money?